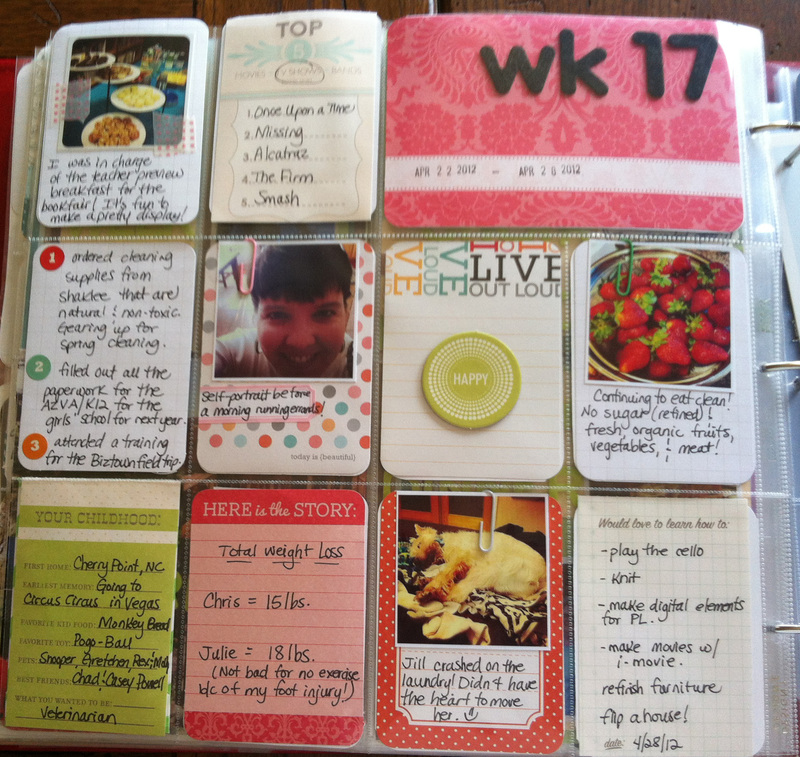 Project Life: Week 17 | I am JuJu! Here we are at week 17! I’m delayed in posting this morning as I actually had the plan to combine weeks 17 & 18 into one layout next week because I only took a handful of pictures with my i-Phone. However, this morning I got to thinking about how I should still make an individual layout and challenge myself to work tidbits of my life (past & present) into this week’s pages. I’m really glad I did that, as it was fun to list some of things I’d like to learn & some of my favorite memories from my childhood. I love the Smash products for such lists! I got all of my Smash products at Michael’s. Below is a picture of the entire layout. Here’s a close-up of the left page which includes several of the pages from the Smash pads. And a close-up of the right side. 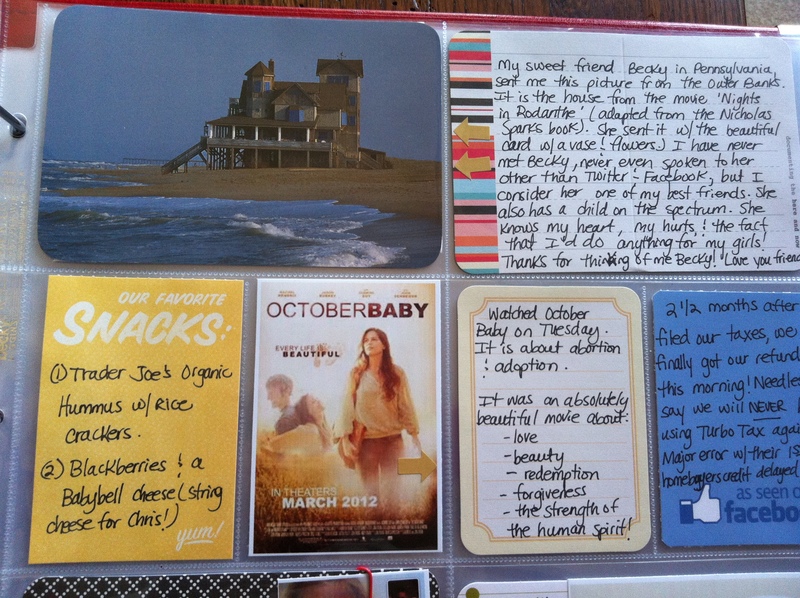 It includes another Smash pad page (Our Favorite Snacks) along with my movie picture and a few thoughts about this beautifully emotional movie, as well as a postcard that my sweet friend Becky sent me & my thoughts on how thankful I am for her friendship! 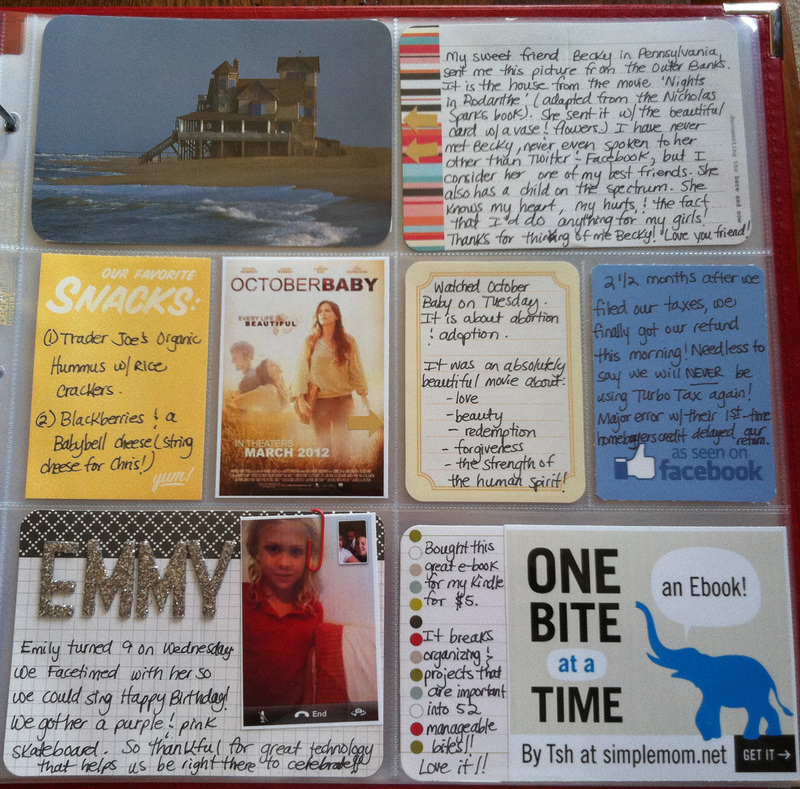 The Facebook journal card was a freebie from Wildblueberry Ink. I also included the card that Becky sent me in the layout this week. I simply hole punched it and attached it to the ring. So glad that I decided to do my layout this morning despite not having many pictures. It was truly a blessing to sit and think about fond memories and all that I have to be thankful for, which is A LOT! I’m linking up with The Mom Creative today! Go check out all the wonderful Project Life goodness! This entry was tagged Project Life Week 17, Smash products. Bookmark the permalink. love the card with photo from your friend, that’s so sweet! 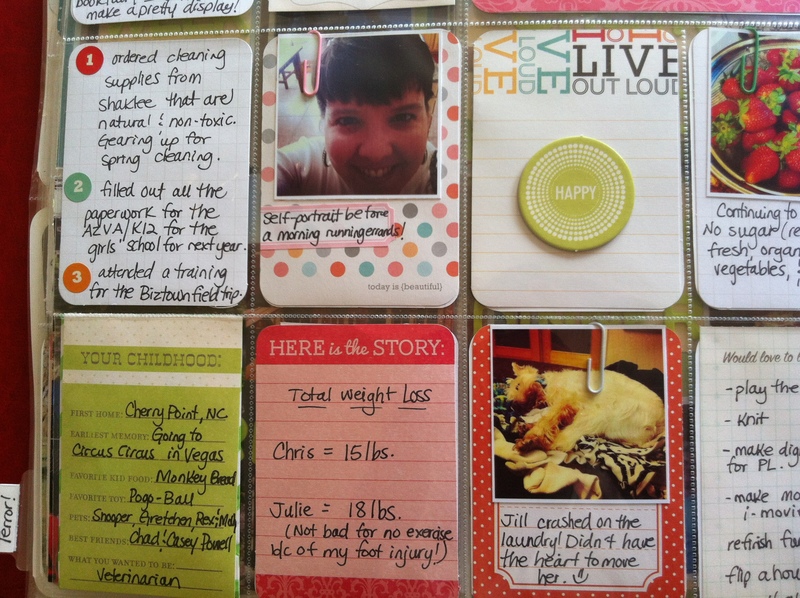 all your words+photos look great together 🙂 the One Bite at a time card is adorable! and the intstagram shots are always a fave in my book! Love how you used those Smash pages to add some extra life details! Those strawberries look so yummy I am now craving some. Not quite in season here yet. Lovely! It is so nice to see handwriting on PL pages – I am trying to do more on mine. Love your layout – it all gels so well together. I love all the bits you included today, it’s nice to have a photo light week and have room for all the fun stuff!